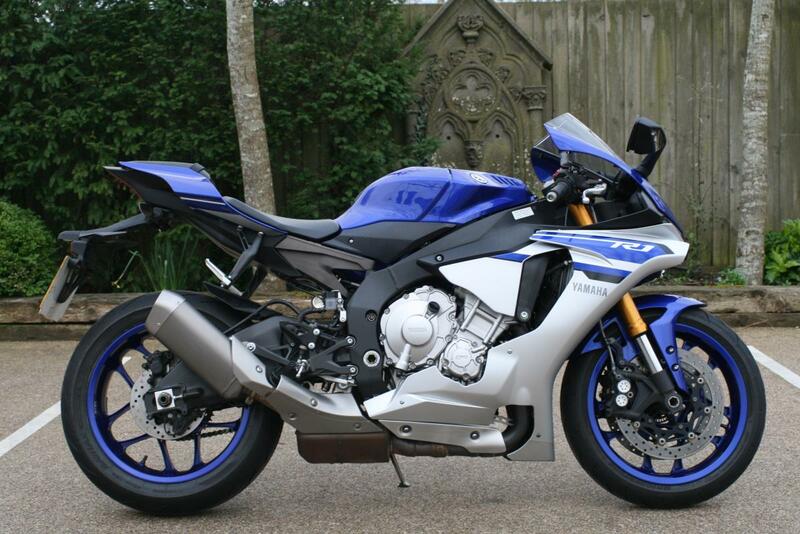 We are thrilled to be able to offer you this fantastic Yamaha R1 in blue/silver livery. Two owners from new this bike boasts a full service history and will be supplied, with an annual service and MOT carried out. Add to that a 3 month roadside assistance warranty and you have a bike to thrill and ready to go, go, go!! Inspired by the 2011 Yamaha YZR-M1, the 2016 Yamaha R1 is smaller, lighter, nimbler and more powerful than ever and boasts a host of electronic riding aids, including a MotoGP-inspired slide control system. Think of the Yamaha as being the size of a 600, with the power delivery of a turbo-charged 1000, all reined in by the most sophisticated electronic rider aids of any current road bike and you’d be some way there. The new shorter-stroke, higher compression crossplane crank motor is smaller, has lighter internals and makes 197bhp – up 18bhp, with slightly less (2ftlb) of torque. It has a new cylinder head with reshaped intake ports, titanium conrods and exhaust, lightweight forged ali pistons with diamond-like carbon (DLC) gudgeon pins, bigger valves with a DLC rocker arm valve train, a 24% larger airbox and new lightweight assist-slipper clutch. Low rate finance is available on this motorcycle, credit subject to acceptance. For a no obligation finance quote, please call 01747 811196 and select option 1 for sales. Thanks for looking! !